killagorilla 80 (killagorilla finished a fair bit behind Mael, so he gets less points than if he would have been closer). I'm going to use ballast to compress the field (relax - just a little bit of ballast), based on your fastest lap times, in race 2 only. Race 1 of each round will always be a normal, unballasted race. 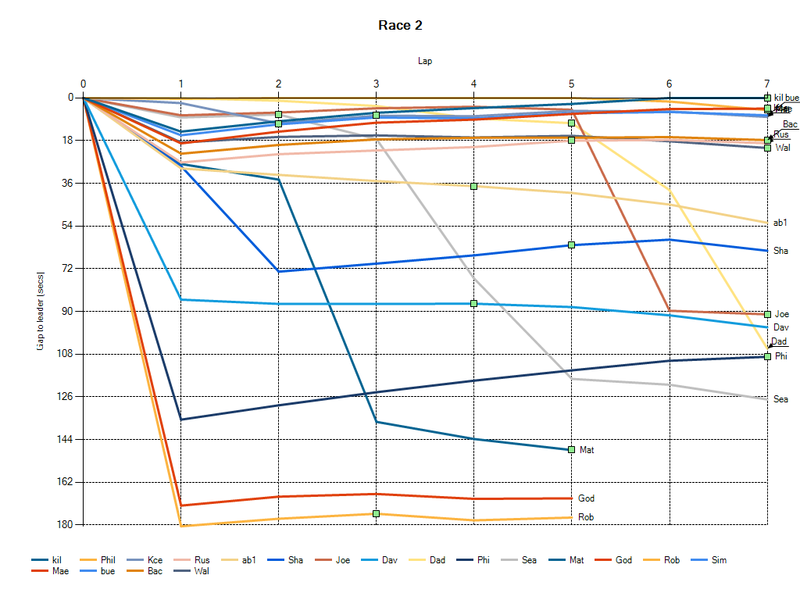 Then race 2 will have some ballast applied to the top 2/3 of the field to compress lap times a little. Race 2 start positions will be in race 1 finish position. I've been doing some research with ballast and restrictor, using the AI. I've found that restrictor is non-linear, i.e. doubling the restrictor does not double the slow down. It's hard to do a performance-based balancing using variable restrictor. Ballast, on the other hand, is nicely linear - doubling the ballast doubles the slow down - so it's much easier to slow a car's lap time by a set amount. Seriously, I really like it, it's like racing combined with time-trial. Always something to strive for. And I've always doubted you can "please all of the people some of the time", there's always one whinger in my experience. No different to any scoring scheme really. If you get badly punted off, it could already cost you a heap of positions. This way, you can at least drive hell for leather to at least reclaim something. Racing against the clock gets you points (provided you can break the "2/3 barrier"). This is a good thing (I think). That's a good idea and it makes it more interesting for the fast guys...instead of just cruising sometimes. Or actually it affects the guys further back as well...it's a good thing and you can use it strategically to your advantage. When it comes to creating close competition a ballast system based on position in the overall standings or based on the actual outcome of the previous race or races (which is reflected in the points you get) would be better though imo. Doing the fastest lap in a race is a nice thing, but it has no direct affect on the championship and therefore I find it a bit inefficient compared to the other options available. Yep, we have tried that a few times in the past too. Your fastest lap is a good measure of your overall pace and who needs to be slowed down - and the good thing here is that you can add appropriate ballast during the round, instead of just applying it next round once you know the standings.